Social media technology promotes social networking, building contacts to get career information. Get Detailed Information from the HollandCodes.com Catalog. Put All of the Facts Together. Use Career Test Checklist. A Holland Code job career test helps you find career job opportunities, career job descriptions, and career search sites. With a job career test, you test your own job aptitude. Holland career self assessment tests use Holland Codes to link vocational interests to job families. Holland assessments use a two or three-letter RIASEC or Holland Occupational Codes. Different Holland Code job career questionnaire tests provide information on the relationship between job personalities and key characteristics, college majors, hobbies, abilities, and related careers. 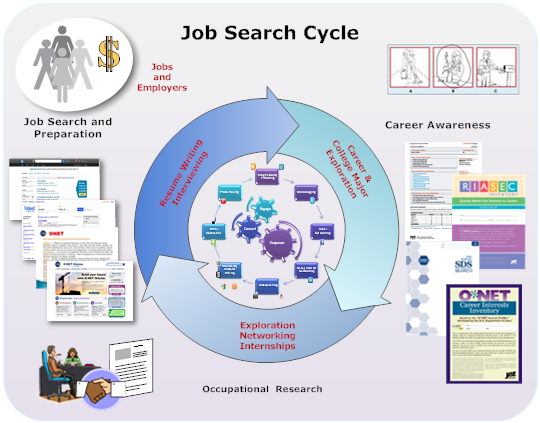 There are three steps to provide career help in identifying career goals and searching for a job. Considering the impact of career decisions. Practice - Practice is essential for a successful interview. A Career Coach will answer your questions. E-mail us. Call us at (602) 753-9112. Leave us a message including your email address. We will answer your questions.